Serial killers, extraterrestrial predators and conservative America’s ultimate boogeyman, Michael Moore, are heading to the Toronto International Film Festival this September. Highlights of the festivals documentary program include the world premiere of filmmaker Michael Moore's much buzzed-about Fahrenheit 11/9, which looks at life under U.S. President Donald Trump. 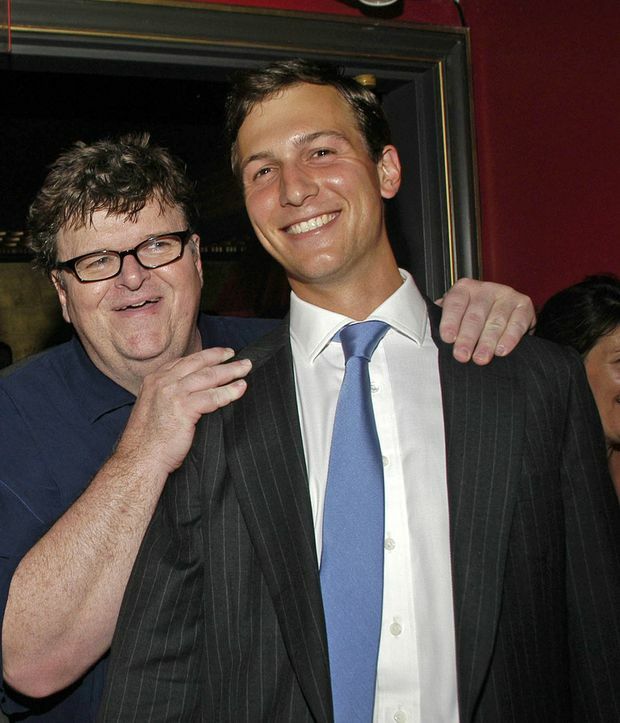 Moore is seen here with Jared Kushner at the premiere of his film Sicko in June, 2007, in New York. On Thursday morning, festival organizers revealed the latest in TIFF’s summer-long roll-out of titles, including details on the Documentary, Midnight Madness, Short Cuts and Cinematheque programs. Highlights include the world premieres of two highly anticipated franchise reboots, David Gordon Green’s Halloween and Shane Black’s The Predator, plus the world premiere of Fahrenheit 11/9, Moore’s buzzed-about film looking at life under U.S. President Donald Trump. Moore’s latest project, whose title is a tongue-in-cheek reference to his 2004 film Fahrenheit 9/11, about the George W. Bush administration, is reportedly so up-to-the-minute that the director is still shooting footage. Moore last appeared at TIFF in 2015, when he premiered Where to Invade Next, a globe-trotting satire in which he proposed bringing the best socio-cultural policies of Europe back to the United States. Yet that film and the director’s most recent project, 2016′s Michael Moore in TrumpLand, failed to elicit the audience response of Fahrenheit 9/11, which remains the highest-grossing documentary of all time. Still, Powers is confident that the director can still sway the political conversation. Other highlights of TIFF’s Documentary program include the world premiere of Quincy, a look at the prolific music producer Quincy Jones, co-directed by his daughter Rashida Jones, and Alan Hicks; Searching for Ingmar Bergman, from Margarethe von Trotta, who is sitting on this year’s TIFF Platform jury; and two docs on the men responsible for the current toxic state of political discourse, Alexis Bloom’s Divide and Conquer: The Story of Roger Ailes, and American Dharma, Errol Morris’s look at the rise and not-quite-fall of Trump adviser Steve Bannon. Like last year, TIFF’s Midnight Madness lineup will be under heightened levels of scrutiny, given it is only the second slate under curator Peter Kuplowsky. The former TIFF programming associate took over the festival’s most eccentric and intense program, which comes complete with die-hard attendees, in 2017 after long-time Madness guru Colin Geddes stepped down. Jamie Lee Curtis returns to her iconic role as Laurie Strode in Halloween. To that end, this year’s Midnight lineup includes both high-profile horror (the aforementioned Halloween and Predator installments), plus outre cinematic provocations (Gaspar Noe’s Cannes hit Climax, Sam Levinson’s Sundance sensation Assassination Nation), experimental genre riffs (Peter Strickland’s In Fabric, Kiah Roche-Turner’s Nekrotronic), and one epic martial-arts flick (Vasan Bala’s The Man Who Feels No Pain). Away from the intensity and topicality of the Midnight Madness and Documentary programs, TIFF on Thursday also unveiled its Short Cuts program (36 works, including Interior from Oscar-nominated filmmaker Reed Van Dyk) and Cinematheque lineup (a 35 mm print of Ingmar Bergman’s Persona). The festival will unveil more of its 2018 titles, including the yet-to-be-named opening-night film, next week.